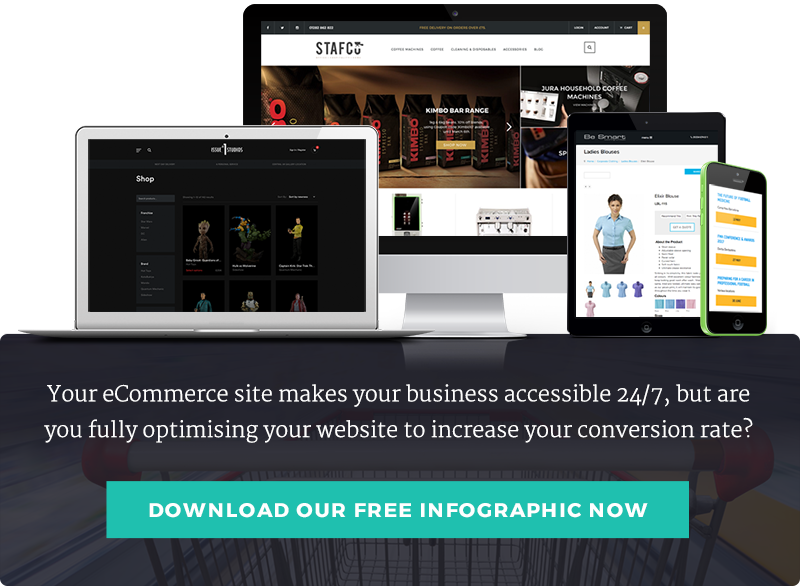 When it comes to ecommerce websites, there are tried and tested ways to increase your conversion rates. As an ecommerce developer with many years’ experience, we know that successful ecommerce development means creating a great user-orientated experience, including having a stunning, responsive website design, the right information in the right place, and the right purchase process to help your customer commit to a transaction. Retailers who are making the most of all that ecommerce development has to offer are investing in brilliantly designed websites that provide a great user experience on every device – from smartphones to smart TVs. The good news is that the quality of your website can put you on a par with the big brands, without costing the earth. Plus a recent highly publicised report from Ofcom has shown smartphones are now the most popular device for connecting online in the UK. This means an increasing number of people are shopping on the go from their smartphones, so businesses owners can no longer afford to not go mobile. Since mobile devices started to gain traction in 2012 you can see with the diagram below how quickly the world is adopting mobile devices to make transactions and purchase products, this trend is only going to continue with a steep climb as technology keeps gaining pace. Your customers don’t have the luxury of being able to pick up, touch, feel or try on your products. So in the online world you must package them beautifully with stunning web design and product shots. A good conversion focused ecommmerce developer will provide a sensory online experience that’s larger than life, showcasing your products with intelligent design and product shots that give your customer the assurance they’re buying a quality product from a quality retailer. Excellent usability means your customers must be able to find what they want, when they want, easily and quickly. Great ecommerce websites are clean and well-organised with clear, distinct categories, providing an easy and exciting online journey which should be uncluttered and signposted with stunning visuals and compelling headlines and product descriptions. Live chat helps to ensure a brilliant user experience. The faster your customer’s concerns can be addressed, the more likely they are to buy. Live chat allows your customers to ask questions or express concerns while they’re in the process of making a buying decision. Plus the process allows you to capture common customer concerns, which you can address to ultimately boost conversion rates. Why should your site visitors buy from you? Will you save them money? Do you have a wider product range? You need to tell your visitors, immediately, why you’re the best at what you do. The best ecommerce development agencies will help ensure you website is strongly differentiated with a USP, branding and professional content writing, ultimately increasing your conversion rates. Free shipping and special offers are proven to increase conversion rates, which is why good ecommerce websites have some form of free shipping option built in. Although you may be giving away some margin with free shipping special offers, you should make more overall as your online sales increase. It’s simple. To increase your profitability, you must improve your website’s usability.